I used Malfrid's pattern #0027 (Kirsten Summer Dress) to create my own version of this lovely dress. This dress is very special, because I used some Opal yarn by Bergere de France that I bought in Paris two years ago. The colorway is not available in the US. 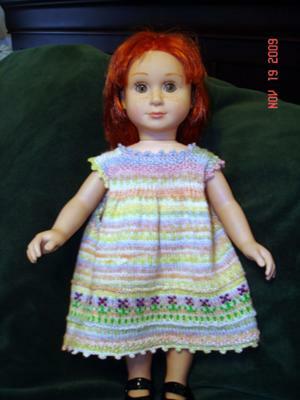 I thought that the soft pastel colors of the yarn would be perfect to create a pretty spring dress for my daughter's doll, Madeline. Madeline is the star of a series of children's stories, about a little girl living in France, that my daughter enjoys reading. I used small multi-color beads for the center of each flower. I still have plans to knit the jacket that is included with this pattern using the purple colored yarn that is in the flowers. I love using Malfrid's patterns because of the rich details in each design. Her beautiful photography and the story for each pattern are wonderful accents to each lovely design. Thank you for making these patterns available to us in English! This dress is so gorgeous. Just love all the colors in this outfit! You did a lovely job knitting this up! Very pretty, like a whole field of flowers! thank you for your comment on photographs and stories. Maulfrid and I divide the work between us this way: She creates and knit the patterns. Then she send them to me and I try to sense the "the sould of the pattern" and then take the photos and write the story. We need the type of feedback you give to know that we do the right things. It is just the same with these excellent pages created by our club memebers ... the picture and the story is important for the readers. What a good idea! Too use the yarn you already have and make a lovely dress! Excellent! I love the beading and finish trim around the neck and armholes. Wonderful job! The colors in this lovely dress remind me of Easter eggs! Your addition of beading really adds a sparkle--very nice! Angela - what a creative and beautiful use for sock yarn! I love the way it makes this little dress look. Your work is lovely!